One of the best things that came out of my recent study of tithing was how much I learned about how the Lord blesses us. Tithing is one of those principles where when we are obedient to the commandment we tend to think we will get a specific set of blessings. 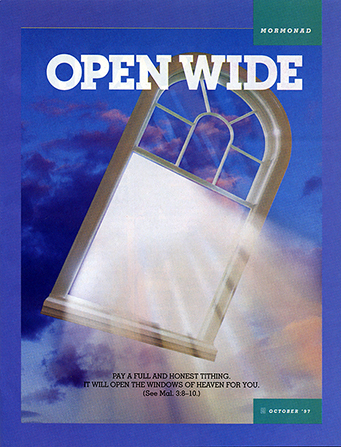 By paying tithing the Lord promises us that he will “open you the windows of heaven, and pour you out a blessing, that there shall not be room enough to receive it.” Malachi 3:10 That’s really open ended! Heavenly Father does not often promise us specific blessings in return for keeping specific commandments. For example, keeping the Word of Wisdom does not mean we will have perfect health, and keeping the law of tithing does not mean we will have financial security. Because of natural consequences, often people who are keeping the word of wisdom have better health, and people who are disciplined enough with their money to pay 10% tithing are often more financially stable. However, blessings we receive for our obedience to specific commandments are not limited to what may be common or to those that seem logical to our mortal minds. When we limit what we are willing to accept as blessings to specific commandments we are allowing ourselves to be susceptible to doubt and deception. We may doubt that we are being blessed for our obedience to a commandment when the blessing we want doesn’t come. And you can bet (you know, if Mormons were betting people) that when Satan knows we are expecting a specific blessing he will try to put something in our way that is a really great imitation of what we expect to distract or deceive us. Satan often presents imitation blessings that seemingly satisfy our desire for an immediate reward, whereas Heavenly Father often presents to us true blessings that look more like “opportunities to learn” (aka trials). So how can we tell what is a true blessing, and what is an imitation? First: As stated above, you may not see blessings because your life is not focused on righteous pursuits. Again, we will not be blessed to satisfy our vain and natural man ambitions and desires. If that is all you are focused on you will not see blessings. Second: There are not specific credit and debit tallies for each specific commandment. It is more of a running total, more like a giant bucket than a compartmentalized lunch tray. Obedience to commandments always brings the blessing of protection from the adversary. So, depending on your obedience to other commandments your adherence to one commandment may be merely slowing or preventing the loss of blessings rather than showing an increase. Third: Sometimes we have been blessed with something for so long we have forgotten that it is a blessing. It sounds silly, but it happens a lot. Every spring I have debilitating hay fever, so I start taking an antihistamine so I can function (not that my function rate is all that high). After a few days I feel really great and I start thinking to myself that I can skip a dose here and there, and before you know it I’ve stopped taking it. It doesn’t take long for my hay fever to return full force. A friend pointed out to me the other day she does the same thing with healthy eating. She thinks she can cheat here and there, and before you know she just feels yucky. We sometimes do this with our blessings. We have had it for so long that we forget that it does not originate from us. If we stop being obedient to that commandment, no matter how long or strictly we have been obedient to it in the past, it would not take long for the blessings to disappear. As I ponder the blessings I have received I can see how they have strengthened my faith and love for our Heavenly Father. He cares so much about us. He makes it as easy as He can to make it possible for us to choose to return to live with Him. I hope that as I become more familiar with His pattern of blessing us I will also be able to grow in expressing my gratitude to Him. I have a related experience, but with fast offerings. A number of years ago I read a couple things about fast offerings from Marion G. Romney. He said that if we double our fast offerings, that the spirituality in the church would double. Another time he said that if we doubled the fast offerings we would increase in prosperity, both spiritually and temporally. That was good enough for us, so we doubled it. A couple years later we found ourselves needing to save money so we decided to stop doubling the offering for a time. It only lasted about 4 months because we noticed that our grocery budget that had always worked for us was never quite enough, and it wasn’t until someone else brought it up to me that we realized the correlation between doubling the offering and our grocery budget stretching. We have since then always doubled our offering because the blessings really are there! I love how you talk about not limiting ourselves as to what blessings the Lord can give us. I had a similar thought a while back when I realized that I was praying for very specific and finite things, when what is truly open to us is blessings beyond what we can even imagine. It was mind blowing when I realized I was trying to put God, and His blessings, in a box!